Long nets in first Clarets outing! Clarets striker Chris Long scored on his debut for the club as the Development Squad beat Rochdale 2-0 on Wednesday. The summer signing from Everton stepped up his fitness with an hour in the friendly at Gawthorpe before being replaced by Jamie Frost. The 20-year-old, who netted four times for Brentford in the Championship last term having made just two starts for the Bees, scored in the 35th minute when capitalising on a defensive slip. Fellow striker Ntumba Massanka completed the scoring in a game which saw Josh Ginnelly make his first appearance since joining from Shrewsbury Town. 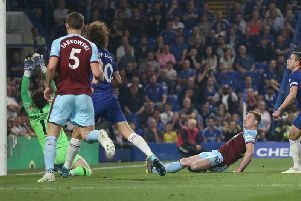 Burnley boss Sean Dyche said: “We’ve had to be careful with him because he was delayed coming in. “He had done some training on his own and that’s never the same no matter how much you put into it, it’s never the same as training with the team and training with the other players. “He’s done very well, he’s worked very hard, he’s getting back up to speed and training with the first team. Dyche added: “I think he’s enjoyed training with the first team all the time and the challenge of it. “I think he’s become aware of the competitive nature of what we bring here in training and the level that’s required. “He’s nicely under the radar. He’s one that we think can develop further through his time with us.